Lucasfilm has let Nissan borrow the iconic Star Wars Stormtroopers for a spot touting the carmarker’s Juke. 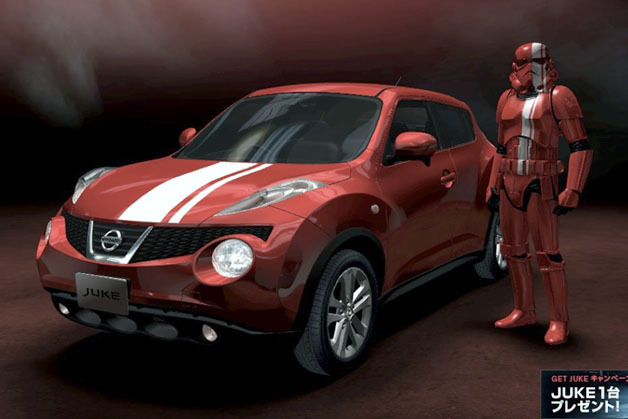 There’s little to the ad except Stormtroopers getting Juke envy when they spy the car, which sports red paint and a white racing stripe. By the end, the Stormtroopers have adopted the Juke’s individualized color scheme. It’s all an effort to get consumers thinking about how to pimp customize their rides, for a small fee, of course. Millenials might not be buying cars in the same numbers as their forefathers, but they love shelling out for funky iPhone cases. It’s not a bad move on Nissan’s part to start offering similar customized options for Juke customers. More importantly, one wonders what the impact of individualism would be on a cloned armed force that, heretofore, has shunned individualism. Sci-fi geeks all know how that played out with the Borg in an episode of Star Trek: the Next Generation. Individualism proves so unsatisfying in a Big Bad army that the Star Trek movie involving the Borg essentially ignored that plotline. Let’s home the Empire stays monolithic in the coming Star Wars reboot. Howard Davidson Arlington MA-I worked with Howard a bunch of times. He’s a marketer who does strategy and lead gen. Great guy.